When reading issues began surfacing within its elementary student population in the mid-1990s, Liberty Public Schools developed an internal tutoring program to help boost those students' scores on statewide reading tests. 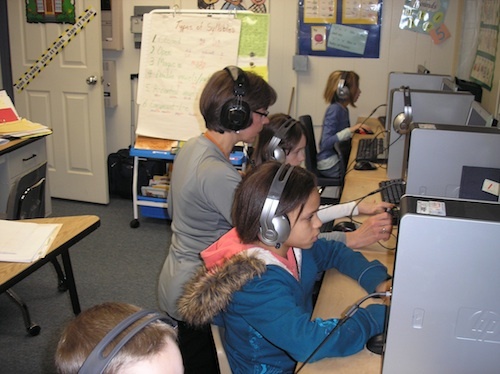 "We noticed a percentage of students who were struggling on the state tests," recalled Barbara Wippich, curriculum and intervention coordinator for the district, which is located in Liberty, MO. We did some research and found that those students in question were actually missing the prerequisites for beginning reading." Determined to reach those struggling students, Liberty Public Schools considered a "variety of programs," according to Wippich, and decided to implement a reading/tutoring program that found a single para-educator working one on one with first-grade students. Topics covered in the Teach, Assist and Practice (TAP) program included sounds and words, reading passages, writing and--for more advanced learners--working with prepositions. The para-educators started working with the students in 25-minute segments every day, and for 10-week blocks. Over time, TAP grew to include more para-educators and students in grades 1 through 5. "Our goal was to get the students up to speed during one, 10-week session," said Wippich, "but we quickly found that even two sessions didn't always fulfill the need." Those students who needed even more intervention than the program could provide were considered "tapped out," said Wippich. "These were the students who were in the program for a while, but still not making progress." It would be 2006 before technology could play a part in helping those challenging cases at Liberty Public Schools, whose superintendent was introduced to Scientific Learning's reading intervention application, Fast ForWord, at a district training session. "He was particularly enthused by the technology's ability to 'rewire' students' brains to be more productive," said Wippich, "and how it would reach more children than our TAP program could." The district decided to roll out the reading intervention program, which was funded through its regular budget, on a small scale. A group of students used it during a summer "test," and a six-school implementation followed in the fall of 2006. Labs were set up at each school, where 15 students at a time could use the reading intervention system for 45 minutes every day. "We brought over the TAP para-educators to work with the students and to monitor scores and progress," said Wippich. The district considered students' Stanford Diagnostic Reading Test scores and its own running reading records to determine which students would participate in the program. Learners who ranked in the 30th percentile or lower were targeted for participation in the tech-based intervention program. To measure the success of those students, Liberty Public Schools used both pre- and post-tests based on a grading system. The goal was for each learner to complete the language and reading programs and then be tested at the end of the two sessions. "As the students finished both sessions and passed the post-test, we rolled another group of students into the program," said Wippich. According to Wippich, the biggest challenge at the secondary school level was the timeframe required to complete the daily coursework on the computer. "The amount of time we needed students to be in the lab (45 minutes) didn't equal the teaching session timeframe," she said. "It overlapped." The following year, Wippich said the technology vendor integrated 30-minute sessions into its lineup, thus eliminating the problem. "The students didn't have to overlap a time period," she said, "and more time was freed up for student-teacher interaction in the lab." The technology helped Liberty Public Schools accommodate more struggling readers than its individual para-educators could take on, but it didn't eradicate the need for those "human" teachers. In fact, Wippich said, the instructors were particularly valuable when it came to intervening "as soon as the student started showing signs of trouble," with the program, which is based on accuracy, not speed. "If a student started doing things incorrectly, and if he or she continued on that path, it would take so much longer to get through the program," said Wippich. "our para-educators had to become even more adept at quick intervention, or risk having students in the program for much longer than necessary." 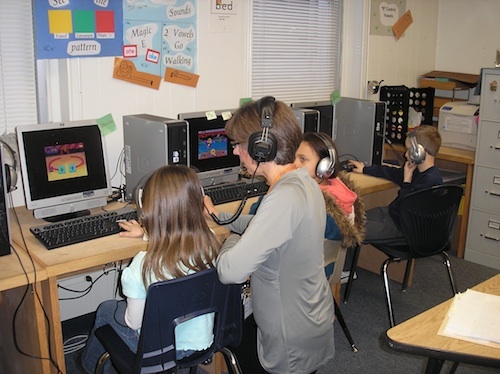 The reading intervention program continues to be used in the district's elementary schools, all of which have posted positive results since implementation in 2006. "It didn't take long for us to see positive results in the classroom," said Wippich. "Those students who were in the fourth or fifth percentile going into it came out in the 20th percentile." Teacher Sharon Binkley works with students in the Library Media Center at Franklin Elementary. Other benefits Wippich attributed to the integrated intervention program included improved spelling skills, homework completion, and positive behavioral changes. "In looking at pre- and post-test scores, I'd say 70 [percent] to 80 percent of the students showed gains by using the program." To other districts looking to capture some of those gains, Wippich said the key to success is to get students tested and--if deemed necessary--into the lab as soon as they enter school. "The sooner we know what we're dealing with," she said, "the better the technology works."